There are unlimited ways to travel the Camino de Santiago………….walking, biking, horseback, even donkeys…..alone, with your spouse, with friends, with children… camping, albuerges, hotels, private homes. This is a remembrance of our Camino. This post covers the first half of our walk–the hotels from Pamplona to Burgos, and hopefully answers questions for Pilgrims planning their walks. We walked the Camino in September of 2014 from Pamplona to Santiago. We began on a bright beautiful August 23 from Pamplona and arrived at the cathedral on another beautiful day, September 22. Our trip of 29 days included three rest days—in Logrono, Burgos and Leon. Our Camino was unique in that we spent each night in a hotel, and found them all to be unique and some to be amazing. 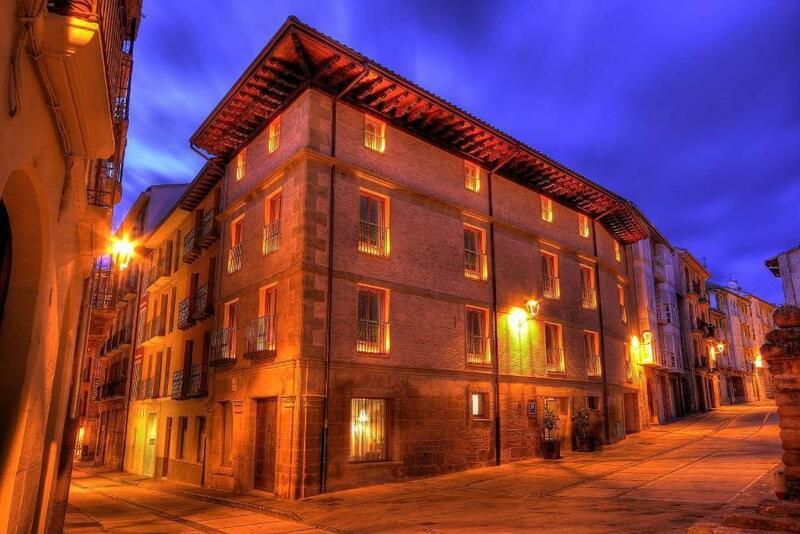 Because this is a time of planning for Camino, we thought this might be a great time to share our experiences of the hotels along the Camino. We certainly understand and commend those who have decided to forego the comforts of a hotel, but some Pilgrims, like us, prefer the hotel options and there are many. Our premise for the hotel selections was this: We always attempted to stay at the nicest hotel available and always stayed in the nicest room/suite available. We were pampered Pilgrims. Even using those guidelines, we spent less than 3,000 Euros during our travels—about 100 Euros per night on average. The hotels ranged from fleabags to converted palaces and monasteries. Some were amazing and we reminisce about a few of them almost daily. Known as Hotel Europa when we traveled, this is located at the edge of Pamplona’s main square. Two very busy bars are located near the hotel and they were noisy very late at night. The room was very small, but included a very small veranda which allowed us to look over the square and the night’s activities. The hotel does have a great restaurant, which we enjoyed and a terrific breakfast. it also appears in photos that the rooms have been renovated since our visit. We rate it a B-. Pros-Location is great, Restaurant is amazing, Service was good. Cons-Noisy, small room, very little ambiance. We were exhausted when we arrived at Hotel El Cerco, but we were blown away by the cool room we were shown when we checked in. It featured exposed brick and old beams and a great bathroom. The room was twice the size of our Pamplona room and was very comfortable. Service at the front desk was terrific and extremely helpful. It was an excellent hotel. The hotel entrance is located in an alley, and is really quite unnoticeable, which underlies what a great overnight place that it is. 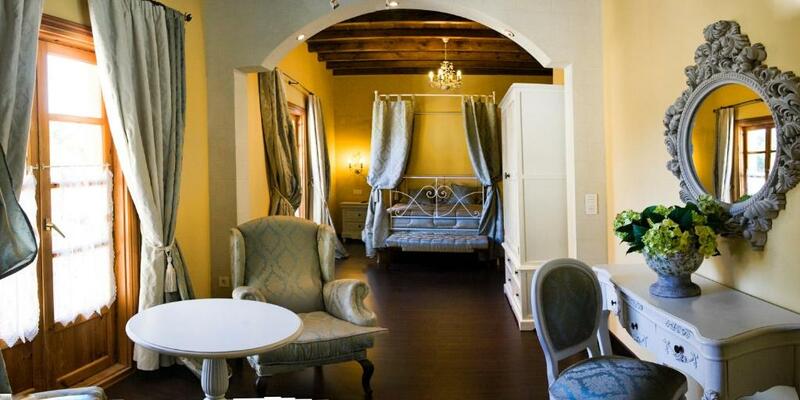 Pros-Beautiful and classic boutique hotel, Top service and cute entry area. Lovely room. Cons-A little hard to find, but worth the effort. This hotel is overrated a little. It is nondescript, but nice. Service was a little standoffish. It is located just off the main avenue and near the cathedral. Jackie slept almost 14 hours that night—after a long walk that day. The room was very spacious and comfortable. 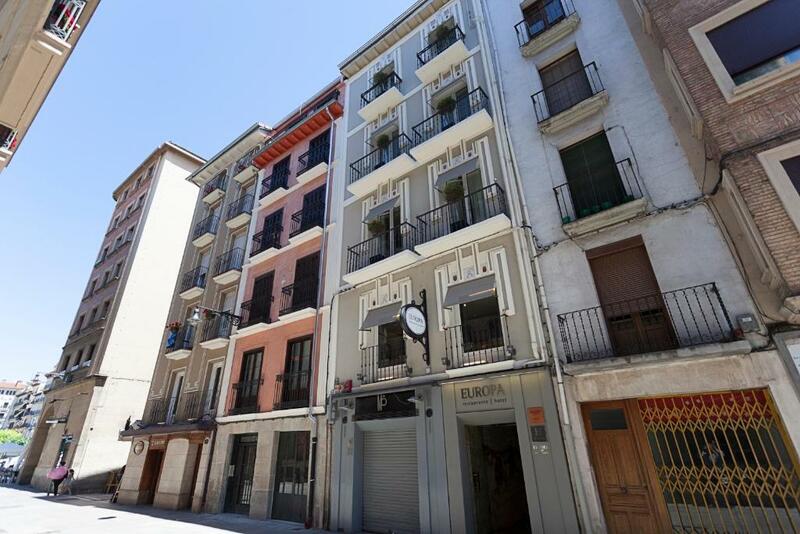 It is said to be the highest rated hotel in Estella, but we found it lacked much character, especially when we now compare it with others we visited along our walk. Wanna feel like your staying at a Best Western in the Midwest? Stay here. We had walked into Los Arcos and took a taxi to the hotel, which is located five or more kilometers out of town. We took a very nondescript room on the second floor and heard traffic from the passing road all night. It was a very non-Camino hotel. Any future visit to Los Arcos would probably include a stay at Hostal Suexte, which is much closer to the trail. From the hotel in Los Arcos, we intended to taxi back into town and start our walk there. Our driver had other ideas. She needed to pick up some fruit from a friend and then made a few more stops and eventually decided that we should be driven to Viana—about 15 kilometers from Los Arco. As a result we had a shorter day than we intended with a walk from Viana (a gorgeous town) to Logrono. 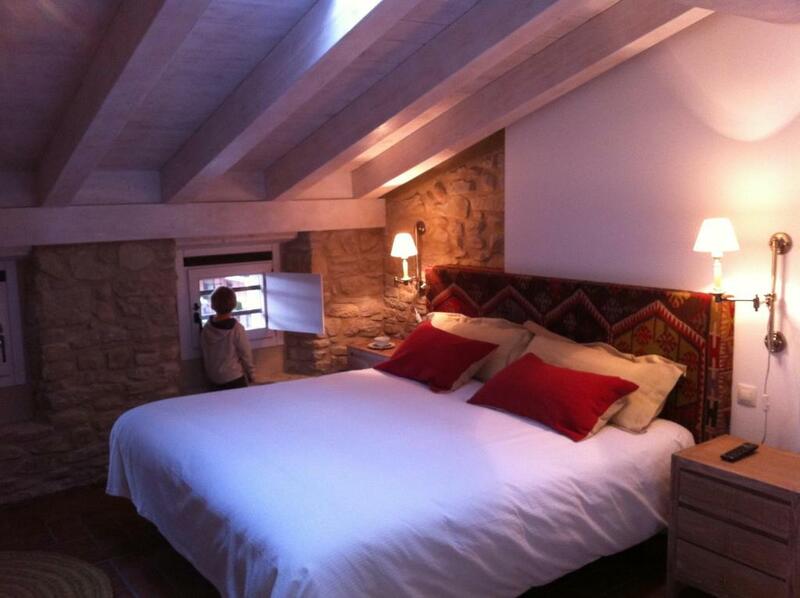 In Logrono, after some searching we arrived at a beautiful room overlooking the main square of Logrono. The hotel opens off a quiet alley, but our huge window from our second floor room framed the bustling square below. The room was amazing—high seiling and exposed beams. The bathroom was beautiful and fashionable. It was a terrific spot. Cons—A little tough to find, but worth the effort. Seventeenth Century Palace…what more can be said? This is a terrific hotel and worth the price. The room had an ancient door with a key that was centuries old. We had tapestries and canopies. We had exposed brick and ancient exposed beams. It is a very classic, but small hotel. We loved the hotel and the attached restaurant, where the breakfast was great. It is definitely the coolest spot on this very quiet town. This revamped hospital building dates back to the Twelfth Century and the public area is awesome. It’s located near the famous “chicken cathedral” and off a small square. 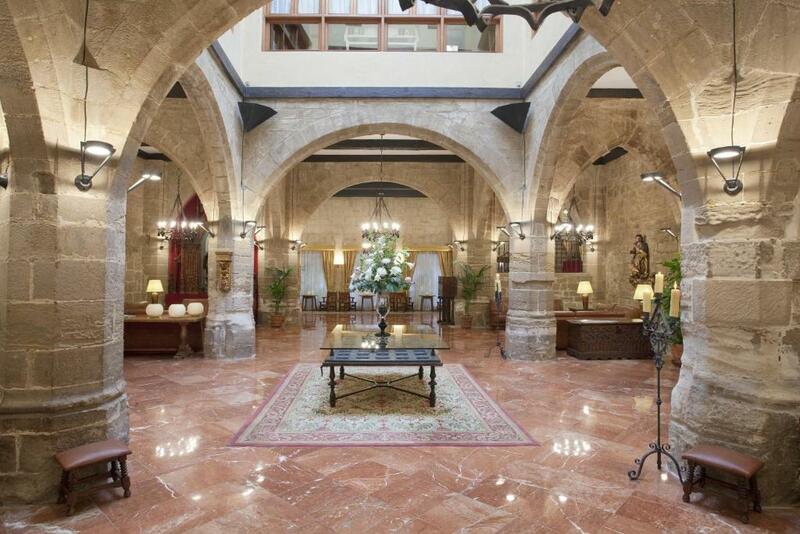 As one of Spain’s paradors, this is a cool hotel. We liked it, but honestly can’t remember anything remarkable about the room and it’s facitilities. We do remember breakfast buffet, and while expensive (25E each), that was very good. Pros-Beautiful public area, Location was excellent. Breakfast was terrific. We arrived at this hotel after a very long day on the Camino. It seemed like we would never get to this town. The temperature this day was over 100 F and we were exhausted. Jackie became ill after eating and we were struggling with heat exhaustion. The managers of this hotel made everything better. Our room was a huge suite—over 2,000 square feet. It was stylish and extremely comfortable. A small bar served tapas, meals and drinks, and a courtyard attracted loads of Pilgrims who were staying in the attached albuerge accommodation. This hotel lives among the top on our trip. It was big, stylish, really amazing. And to top it off, the managers of the hotel helped arrange a taxi for us to travel the following day more than 80 kilometers off the Camino to Santo Domingo del Silos to attend mass with the Benedictine monks. Pros-Unbelievable service, very large room, friendly and stylish. An all-star on the Camino. We stayed a rest day at the hotel and therefore spent a second night. It was quiet and easy to find, but we would probably do more research before staying here again. We remember that the room was very nondescript, and the front desk area was smaller than we would have anticipated. The restaurant is supposed to be excellent, but we ate our meals in the cathedral square. Breakfast was very good. The cathedral of Burgos is the most beautiful and inspiring building we have seen. It is worth the blisters earned to get there. Pros—Location, location, location. View from the room was majestic. Very helpful. You covered some of the same places my husband and I stayed last year and I concur. You missed a good one in Logrono, Hotel Check-in where manager Nacho is superb. I’d love to get the rest of your list. We are leaving 3/25 and hoping to walk Burgos to Santiago.